Why Is Breast Cancer the Shopping Disease Anyway? Every October I am more and more baffled by the sheer amount of stuff being marketed and sold in the name of breast cancer awareness. If you can eat it, drink it, play with it, wear it, hammer with it, bake with it, travel in it or even put your trash in it; there’s probably a pick version of whatever it is available and waiting for your purchase at one of your friendly local retailers. Just when you think you’ve seen everything, you see some new gizmo or product adorned in pink, and you realize no, there’s more where that came from. The crap just keeps on coming! Somewhere along the line, breast cancer morphed into the shopping disease. How the heck did this happen anyway and are we not all perhaps a bit responsible? After all, if breast cancer and the infamous pink ribbon were not such effective marketing tools, we wouldn’t be dealing with all this pink shopping fallout now would we? Breast cancer sells. Pink ribbons sell. 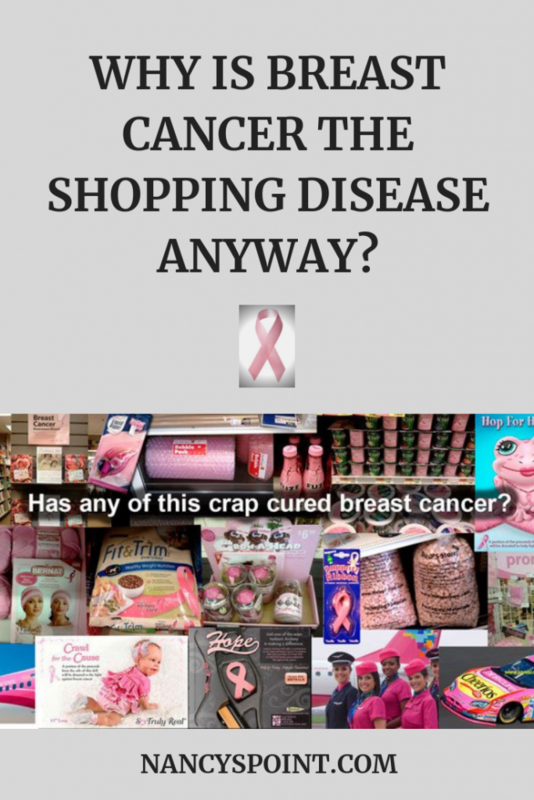 Yes, breast cancer is the shopping disease and this doesn’t sit right with me. I don’t like the idea of corporations profiting from a deadly disease. I don’t like the fact that people who buy all this stuff are often being misled as to how much is being spent on breast cancer research or for that matter, anything to do with breast cancer. I don’t like how this now annual gigantic feel-good shopping campaign seems to get extended well before/past October. I don’t like a deadly disease being all prettied up and over-simplified. And I don’t know about you, but I find all this shopping being done in the name of breast cancer awareness to be sexist in the first place. Women, breast cancer, shopping… why do they have to go together? Why has no other disease been exploited like this? Why aren’t we shopping “to support prostate (insert any other kind) cancer awareness”? To grab a copy of my FREE ebook, Pink Is Just a Color, Ribbons Are Just Ribbons: A collection of writings about Pinktober shenanigans, Click Here. I think the short answer is because it’s been easy to zero in on breasts breast cancer. It’s been easy for corporations to slap on ribbons and sell stuff under the guise of breast cancer awareness. It’s been easy for the seriousness of this disease to be glossed over and wrapped up in pink. It’s been easy because people want to jump onto the emotional band wagon here. After all, most of us know someone affected by breast cancer. Many of us have a grandmother, mother, daughter, sister, aunt, cousin, co-worker or friend affected by this disease. We all want to feel as if we’re doing something – anything. And so we sometimes do what’s easiest. We buy pink stuff or stuff adorned with pink ribbons thinking it’s a win-win for all. Perhaps we have all been a bit vulnerable and fearful as well. Perhaps we have all been taken advantage of more than a bit. Partly because of this vulnerability and fear, breast cancer became a marketing gold mine for corporations big and small. We allowed this to happen. If we allowed this to happen, we can also undo it too can we not? Sure, breast cancer sells. Pink ribbons sell. What if we didn’t buy all that stuff without first reading the fine print about where the donated dollars go (if anywhere)? What if we demanded transparency from corporations and companies big and small, so we could actually tell what products are worthy to purchase (donation dollar-wise) and which ones are not? What if we all put a little more thought into our pink purchases? What if we simply donated directly to causes we care about instead (like research)? I’m not saying stop buying stuff with pink ribbons on it. This probably isn’t even possible anyway. I am saying don’t buy something just because it has a pink ribbon on it. Digging deeper and being a more informed shopper takes a bit more time. Doing these things isn’t as easy. But in the long run, doing them anyway just might make a difference and actually end up accomplishing more to prevent, treat and maybe some day cure this disease. After all, easy isn’t always better. As the late Barbara Brenner once said, If breast cancer could be cured by shopping, it would be cured by now. To get more articles from Nancy’s Point delivered weekly to your inbox, Click Here. Has any of this crap cured breast cancer image via The Accidental Amazon and used with permission. Why do you think breast cancer is the shopping disease and how do you feel about it? You raise some great questions. I am hoping with some of the new alliances, organizations trying to work together, and great posts by you and other bloggers as well as raising awareness we can move forward. I am impressed with the livestream that Dr. Susan Love, Gayle Sulik, and Lisa Adams participated in and can be seen at the link: https://thinkorbit.app.box.com/thestream101113 where they talked about this and there needs to be much more of this kind of awareness getting out to the public so they understand the history and why we need to move forward. I love your quote by Barbara Brenner,”If breast cancer could be cured by shopping, it would be cured by now.” As always great post Nancy! Susan, I’m hopeful we can move forward, too, and I’m also hoping the new alliance is a step in the right direction, though admittedly, I’m skeptical as well…Time will tell I guess. I love the quote from Barbara Brenner and it just seemed to fit so well with this post. Thanks so much for reading and commenting. Amen again Barbara Brenner. Well said, as always, Nancy. It took me about a year after my METS dx to get my mother (who has been through the breast cancer wringer herself) to stop buying me pink crap adorned with pink ribbons. You can stir people up about ANYTHING with the right tactic. The Pink Machine has perfected it. Shelli, I’ve received some of those things too, but not lately – I think I’ve scared everyone off. But seriously, those gifts that are given out of love and compassion – that’s not really what this is about is it? Profits for the pink machine – that’s where the problem lies and in the complete overdoing of “pinking”. Thanks for sharing. I must admit that I am likely a contributor to this shopping frenzy that has been created. Before learning the facts about pinkwashing and cause marketing, I was duped into believing that by buying pink I was actually contributing to bc research/support. I was actually overwhelmed by pink one day when I was out shopping early in October. I was buying groceries and thought I might get some fresh mushrooms. However, the only ones I could find were packaged in pink. I left the store without mushrooms that day. It is getting to be too much when you see pink port-a-potties, pink guns, pink pasta etc. I will certainly do my part to turn it around and help put an end to “pinktober”. Barb, It’s all about learning the facts and becoming aware, so don’t beat yourself up for feeling duped. You’re not alone that’s for sure. I never really gave it much thought either until I read the book, “Pink Ribbon Blues” and started learning from others who were speaking out as well. My eyes were opened pretty fast. There is so much money involved, which might be fine if more $$ were actually going where they could do the most good and bottom line – if fewer people were dying of bc. You are doing your part now – that’s what matters. Thanks for sharing! Why do we think breast cancer turned into the shopping disease? I agree with your statements… the greed of corporations doing the selling, and the desire to give a little doing the purchasing. Toss in the breasts and you have a perfect mix for exploitation. I have a lot of pink crap myself, given to me over the years… well meaning and kind gifts. They are in a drawer. The cringe drawer. Thanks for another great post Nancy! Carolyn, Sadly, it is, or has been, a perfect mix. Perhaps change is in the air… Too bad you didn’t get your tomatoes, but good for you for sticking to your principles. And cringe drawer, that’s a good one. Thanks for adding to this discussion. You make some great points here. I always wonder where the money goes. And why push pink? Why can we not push the message of self awareness not only for breast cancer, but for physical well being in general. Sick of this propaganda and these marketing stunts. I used to support an organization that supposedly talks about awareness in high risk young women. I attended one of their fundraising events in the meat packing district of NYC, and was horrified at the amount of liquor consumption and the pink donuts and pink hard lemonades and pink cup cakes – all that for spreading health messages?!? It was just rich people selling the pink label NYC’s elite. Shikha, I’m sorry you had such an awful experience at that fundraising event. Sadly, there’s a lot of that type of thing going on in the name of awareness…We do need more collaborative work across the board in cancer research and more/better messaging about how to strive for physical well being in general – without the blame game coming in to play. Thank you for chiming in here. I knew a woman who was in the last stages of breast cancer when her town got together, raised money in her name and then bought a pink firetruck. She was there for the dedication and then died about a month later. I am not sure if any of them, including the woman, realized nothing had actually been done for breast cancer. Everyone wants to help but we want to see immediate results. Pink trucks, pink hats, pink ribbons. We are aching from loss and the pink whatever answers that rally cry. Corporations are institutions with the focused goal of making money. It is not their fault but ours for not paying attention. Mae, What a sad story all the way around that you shared…It comes back to the basic question we should all be asking when faced with purchasing pink products or when asked to support breast cancer awareness- who is really benefiting? If we think a bit harder about the answer, we might rethink some of our choices. We have all played a hand in where we’re at, but we can also all make a difference based on what we do from here on out, and not just in October, but all year long. Thanks for sharing. I have a theory that when an asymptomatic woman buys pink she may secretly believe that this item… No matter how obtuse..Will in some way “ward off” the demon for them ..call it superstition.. Karma .. Whatever you like. We need to keep chipping away at the pink washing/brainwashing effect! 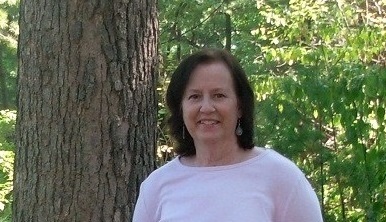 Great blog again Ms Nancy! Marcia, Interesting theory you have there. And yes, we’ll keep chipping away… Thanks for reading and for commenting too! Pink sells because people are buying, plain and simple. As much as I like to rant privately about corporations, they are simply doing what they exist to do, make money, even if the method–exploiting women and a disease–is disgusting. At what point does consumer responsibility come in? The best way to stop corporations’ production of garbage like this is to vote with dollars, which is almost too hard to do. I’m getting tired of constantly switching brands because a brand I used to like gets in bed with the ribbon. I can write a letter to that egg company I used to like, but it matters not if just little me stops buying their products. What do they care if one person stops buying—it needs to be the loss of many shoppers. How can consumers be expected to be responsible when it does not even occur to them this thing might be a problem? I realize that the Al Jazeera program with Dr. Love perhaps reached a few people previously unaware of this issue that is so important to some breast cancer patients—it is just taking so long. Cancer Curmudgeon, I always remember what Hilary Clinton said a while back (I think it was her), it takes a village. I think what each of us chooses to do does matter. Even cutting some of those profits a little bit counts up and at least I sleep better at night; well, a little better! And I do I think more and more are questioning… yes, progress is slow and taking so long, but…Thanks for adding your opinions here. OK, I did press the crap link and OMG!! Well, you warned us that it would be crap. The shower head is creepy. My favorite one (also NOT!) are the playing cards. I wonder if the Queen of Hearts has had a breast removed. Seriously, I do see the conversation about breast cancer changing, but I am skeptical that it will change our culture. It’s impossible to buy anything and avoid the pink ribbon. Everywhere you look, it’s all over the place. I’d like to be a hermit. I bet they don’t get assaulted by such pink crap! Beth, Yes, the playing cards… hmmm…Lots of crap to pick from unfortunately. I think there are lots of people trying to live a hermit-type life style this month and I completely understand why this is. Thanks for coming out of hiding to comment on my post! You always have great articles on pinkwashing. I’m so frustrated that they continue to be needed. I shared your article on the Pinkwashing Hall of Shame on Facebook and Pinterest. Nancy this is a fantastic post. I have also recently become dubious about what seems to be the commoditization and oversimplification of such a serious issue. I’m curious though, how much of the money from the average random retail item that includes a pink ribbon or otherwise bills itself as a purchase that will help the global fight against bc, actually goes to the cause? If some manufacturers add pink to their products without donating a dime and just hope to “ride the wave” then of course this is morally repugnant no matter how much they justify it to themselves by thinking that they are helping “spread the message”. If on the other hand, the overwhelming majority of companies that participate actually donate some money, then there is an argument to be made that some small contribution at the expense of commercialization is still better than nothing? Victor, Your question is a good one. I guess I just don’t feel like settling for “small” is good enough when there is so much money involved and a whole lot of deception going on as well. My main point really is – consumers should be expecting transparency when they purchase the pink stuff. It’s really easy to ask any given retailer how much is being donated and where the money is going. Reading the fine print is also relatively easy. It really is as simple as “Think Before You Pink”. And again, why is breast cancer the “disease of choice” for shopping? The whole commercialization thing has just snowballed into something other than mere awareness raising. Who is really profiting? It always comes back to that. Thanks so much for reading and for taking time to comment. Amy, Sounds like you and I are on the same page… As for that agenda you mentioned, I think many times it’s more about company profits than anything else. Thanks for reading and commenting. The only relations from these products its only that pink is the official girly color, other than that IT IS CRAP. Well lets hope this attitude will change as time goes and lets educate others. Good job Nancy. Festus, It’s always important to be a well-informed consumer, but when the pink ribbon is involved, it becomes even more necessary. i love the fact that they have customized breast cancer and branded it in a oink way to create more awareness. my problem is if the cash raised during this campaign help to combat cancer or help the survivors in any way. Breast cancer awareness is a big business with more corporations and companies eagerly hopping onto the pink bandwagon. It is a bout making profit. I understand the Think before you (fill in ribbon color) campaign. I also know seeing all that pink reminds me to get my yearly mammo. What is tied to Oct for me is that. My mom had BC and my sister is a recent survivor. Sure, govt should do more but they don’t. This empowers women in local ways to support a worthy cause and each other. Is it all a bit much? Yes. What are the alternatives? In an imperfect world, it raises awareness. And no, I do not buy all things pink. Frankly, turning American consumerism into fundraising makes as much sense as anything in a world where things that matter are chronically underfunded. The money is meant to further research. but smart people and otganisations use this to try and show that they care yet its profit that they are making. October 13th Is Metastatic Breast Cancer Awareness Day – Seriously, Just One Day?